We finish our Shabbat meal and I leave to wish "Mazal Tov" to neighbors who are holding a shalom zachar party, celebrating the birth of their baby boy. Around the table there's talk of neighbors who've already been recruited. Some friends rib me: "We thought you're a combat soldier, how come you're still here?" The truth is I wasn't expecting an Order-8 (call for reserve duty). It's true that I belong to a reserve combat infantry unit, but being older than 41 I'm treated as "frozen goods." Just a few weeks ago the unit geezers marked our antiquity, underscored by the fact that we're done with active reserve service. 11:30 PM. There's a knock on the door. It's an "Order 8." I try to get organized. I used to keep a knapsack packed at all times precisely for this reason, but now everything's scattered about the house. My wife and daughters join the effort and we collect everything, item by item. At some point I wonder whether I should pack my tefillin (since it is Shabbat, and I won't be needing them until after Passover's end, on the following Friday). I recall how the late Rabbi Meir Freiman insisted on taking along his lulav and etrog for the Sukkot holiday when he was recruited on Yom Kippur. I pack my tefillin. At 3:00 AM, in Tzafria, a young officer of the elite Egoz unit gets on the bus. I see how delighted he is to have been called, so eager to go in and hit the terrorists. In an instant my own mood changes and I, too, become filled with strength and decisiveness, recognizing that I've been given an opportunity to defend with my own body my home, my wife and children, and the whole nation of Israel. 6:00 AM. We reach the Ofer compound, our headquarters. The organizational disarray is considerable. It takes us an inordinate amount of time to locate our supplies and set up the equipment. In the meantime I began preparing for morning prayers. In the camp synagogue some 200 people of all walks of life assembled: knitted kipot, Charedim ("ultra-orthodox"), Sephardim, Chassidim. At the end of the service a recent baal teshuvah ("returnee" to Torah observance) approaches me: Do you have any hand-baked matzah? He does not eat machine-baked matzah and hasn't eaten a thing since yesterday. I make kiddush, we share my matzah and improvise a Shabbat meal of sorts. The atmosphere is quite cheerful. It's heartwarming to see such a spirit of volunteerism all around. I meet a father of six who nevertheless left his family and enlisted. I am happy to meet our company commander, Major Moshe Gerstner. An outstanding officer. In the morning we are informed that we will be positioned in Jenin, and to that end we're going to receive some training in a military installation up north. We arrive there at noon and begin our training, which includes a series of exercises for combat in urban terrain. Among the guys in the company I'm known as the elder statesman. I've been with this unit since '82, when we went into Lebanon to take over Sidon. My contemporaries, with Lebanon behind their belt, know urban combat inside and out. So we ask the company commander for a pass to hop home to pick up essential supplies. Because of the urgency of my Friday night enlistment I hadn't brought many needed items. Besides, I haven't tasted any real food on base because of Passover. I want to go home to eat. 7:00 AM. We return to base for the final preparations before embarking on Jenin. Our company commander brings us up to date on the coming operation. There's tension in the air. I sense the need for words of encouragement. I open the Chumash (Bible) and read aloud a few verses regarding the need to fight with determination, without fear. The company commander asks me to keep it up, to lift up my fellow soldiers' spirits. I continue talking along the lines of Maimonidies' dictum that when Jewish soldiers go to war they must do so with absolute faith in their victory and without any fear — because of the absolute assurance from G‑d that He goes with us. In the evening it pours. We are a rather large group of religious soldiers. As the holiday (i.e., the 7th day of Passover) begins, we stand under a lamppost to conduct the holiday evening prayer. The regiment's chaplain gives a motivational speech, and then we make kiddush on board our troop carrier. I've brought wine and matzahs and now conduct a holiday meal of sorts. We set out in a massive column, which includes tanks, troop carriers, heavy bulldozers and countless other vehicles. We arrive in the Jenin refugee camp in the morning hours. We cross the camp, and everything seems quiet. Not a single shot is fired. Things appear to be simple and easy, but we sense tension in the air, even though we're not sure why. 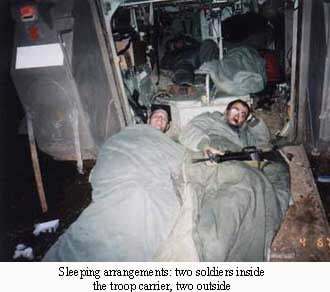 I recall our company commander's last words: "This is no laughing matter. I've commanded many missions in my lifetime, but this is the most challenging operation I've ever run." We reach the hilltop on the outskirts of our target. The company commander gives us our final instructions and the force is on its way. It's 11:30 AM. I take advantage of a few free minutes to wrap myself in my tallit and pray the morning holiday prayer. Suddenly I hear one of the communications men yelling, "Chief is hurt!" A short while later it turns out to have been our chief, Moshe Gerstner. He was hit by a sniper directly in his temple. Our men risk their lives without hesitation to remove him under hellish fire and put him, critically injured, on a chopper. A disturbing pall falls on the warriors. Things get worse when two more soldiers are injured. At that moment our Number Two and his three platoon chiefs take command and lead the company in an exceptionally competent fashion, under the toughest of circumstances. I finish my prayer with a heavy heart and make kiddush. Suddenly the regiment coordinator comes to me and says the Gerstner family is asking for Moshe Gerstner's belongings. I wasn't born yesterday. I understand immediately what this means. The blow is terrible for all of us, and particularly for me. Throughout the day there's heavy fighting in the camp. I am engaged in transporting forces from one point to the next in a troop carrier. As long as you're inside the carrier, you're relatively sheltered, if you're careful to avoid the explosive charges laid out by the terrorists. The problem begins as soon as you stick your head outside or when you try to move from one house to the next. Inside the camp, snipers positioned themselves in protected nests, which are very hard to locate. The tank crews ask us to point out the sources of fire but it's extremely hard to do; the shooting is accurate and highly focused. One guy experiments with a helmet that he places on top of a stick and extends outside our position. The helmet is shot at immediately. Meanwhile, we receive warnings that teams of terrorists are planning suicide bombings near IDF troops. This forces us to heighten our senses and stay on guard even more accutely. Then our kosher food runs out. I call up Yaakov Kenig of Kfar Chabad and ask him to send us wine for Shabbat kiddush, rolls and other food. I also ask for coffee and tea. I coordinate with the company sergeant who's accompanying an injured man to the hospital and is then due at a funeral, to pick up our food on his way back. Lo and behold, he appears before Shabbat with a bag full of food which helps us through the holy day. 7:00 AM. I finish my guard shift and begin the morning prayer. Suddenly one of the guys from our sister company runs over and asks me to put on tefillin. 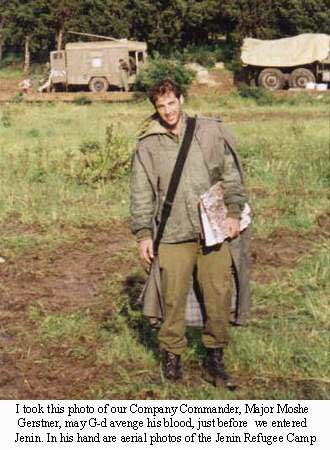 The entire platoon follows suit, and a line forms for my tefillin. Guys who always refuse to put on tefillin now ask to do so. I don't understand what's going on. 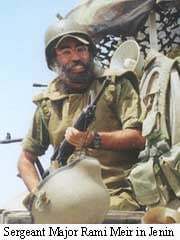 Then one of the soldiers tells us about the shocking death of Einan Sharabi, may G‑d avenge his blood. He was with the forces who took over the camp. 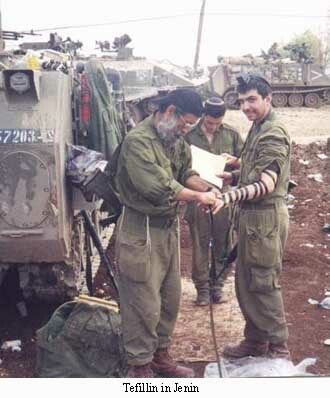 His unit finished clearing one of the houses and Einan found a quiet corner, wrapped himself in a tallit, put on tefillin and stood in morning prayer. A Palestinian sniper tried to shoot through the window into the house. One bullet hit the window guard, ricocheted and fatally hit Einan. In solidarity with the fact that their comrade had been killed while putting on tefillin, all his friends want to put on tefillin. On Friday afternoon we're ordered to go outside the camp and situate ourselves in a field on the mountain slope. I tell my buddies, Let's get a minyan together. Quickly we assemble a prayer quorum, half of which, by the way, is composed of non-religious soldiers. It's hard to describe the feeling of singing the Lecha Dodi verses in an open field, in the middle of the toughest battle. After the Kabbalat Shabbat prayers I make kiddush on wine for everyone. We all a Shabbat meal out in the field. The atmosphere is upbeat and we even have food to share: rolls, tuna, kosher spam and a few tomatoes. Two hours later the supplies arrive, with ammunition and hot food, but everyone was already full. 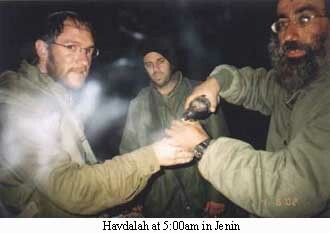 The entire Shabbat we stayed put, while in the refugee camp the fighting continued from one house to the next. Late afternoon, between Minchah and the end of Shabbat, I gather the soldiers together and teach them a chapter from the tractate Avot (Ethics of our Fathers). Saturday night we embark on a complicated mission, in collaboration with special forces — who arrive to complete the refugee camp takeover. It's a difficult and dangerous mission, demanding a high state of alert to avoid taking hits. I go to sleep at 2:00 am. At 4:00 I'm awakened. Our boys came back from the refugee camp and want something to eat. You can't imagine how happy we all are to see everybody alive and well. We hardly exchange words. Only a handshake, or a pat on the shoulder, without any words, but those gestures say everything. An officer from the settlement of Eli, a religious guy, asks me, "You have any wine left? I haven't done Havdalah yet." I have exactly one cup of wine left. The man does the Havdalah ceremony and only then does everyone touch their food. These days we're sleeping three to four hours at night. A shower or even a change of clothes are out of the question. In the morning we get orders to move to different assembly areas. Everyone who passes by me asks to put on tefillin. One fellow comes to ask how to make the "HaGomel" blessing of gratitude, after three bullets whistled right above his head. This was a soldier who never put on tefillin in the past, yet now he came to give thanks to G‑d for the miracles he experienced inside the camp. It's heartening to see the wonderful spirit of volunteerism among the guys. Two of our people suffered dehydration in the house where they were staying and a doctor ordered their evacuation. Afterward they fought to get back into battle, knowing full well the kind of hell they were going to. Men who were chronically absent during training sessions were here now. Every last one of them. You see the nation of Israel in its finest hour. All the talk about "conscientious objectors" seems like from another planet. The exact opposite holds true. In the evening the camp takeover nears its completion. Tens of armed terrorists surrender and turn over their weapons. There are still a few pockets of resistance, but I believe that by morning and the next day we will manage, with G‑d's help, to finish the cleanup in the camp and to finish off the final pockets of resistance. Where will Gilad Shalit be this Passover?